One Mom's Moxie: $25 Darden Restaurants Gift Card 4 Hour Flash Giveaway!! 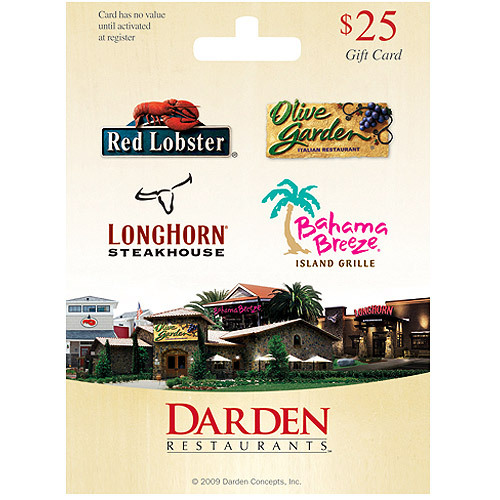 $25 Darden Restaurants Gift Card 4 Hour Flash Giveaway!! Welcome to the Monday Pay it Forward 4 Hour Flash! Tonight, 1 lucky winner will win this $25 Gift card to Darden Restaurants (Longhorn Steakhouse, Red Lobster, Olive Garden or Bahama Breeze). Hurry and enter, it ends at midnight! Be sure to visit them and thank them for these awesome giveaways! Out of these: Olive Garden! Mmmm Olive garden. Yes please! I love Red Lobster! It is my favorite! My favorite restaurant is Longhorn Steakhouse. My favorite restaurant is not one of these, Texas Roadhouse. But, if I won, I'd go to Red Lobster. They are the closest to me. I love me some Red Lobster!! !